a "minimal design with tools" is a good example of how to use this theme. an "out of the box design" is probably not a good fit for this theme. "The most advanced responsive front-end framework in the world." "Foundation is made by ZURB, a product design company in Campbell, California. We've put more than 15 years of experience building web products, services and websites into this framework. For more information or support, please visit http://foundation.zurb.com/"
This theme has been manually tested successfully creating and viewing nodes and style guide in Backdrop 1.4. NOTE -- this theme is stable but being developed. If you have spare time and shared ideas on how to propel it forward coding cleanly and under the appropriate licenses, you are welcome to join in and offer advice or build it together. Special thanks to the developers at ZURB for this great work! This theme does not use the ZURB grid or any grid by default -- it relies on the Layout module to provide that. After clearing your site cache, visit /admin/appearance/list . Enable ZURB Foundation 6 Subtheme, and make it your default theme. 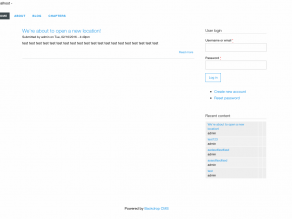 Now, you can edit custom styles in this theme while it inherits styles from its parent theme zurb_foundation_6. When updates come out for the zurb_foundation_6 theme, you can just copy and paste or update the parent theme any time and it won't erase your custom theming work (which is done now in the child theme zurb_foundation_6_subtheme). You work in the top-level zurb_foundation_6_subtheme theme. If you like, you can rename every instance of zurb_foundation_6_subtheme to your own theme name, and by copying and pasting your subtheme folder, you can create more than one subtheme.